I was unable to attend this years Boyd and Beyond symposium that took place last weekend down at Marine Corps Base, Quanitco In the sitting tradition of this great group and their efforts to continue Col John Boyd's legacy my friend and fellow Boydian, Scott Shipman purveyor of To Be or To Do has put together a very good recap of the learning that took place during the two days. Read Scott's recap and as you do keep next October 2013 open and make the effort to attend. They are also looking at holding a West Coast Boyd and Beyond as well. The learning that takes place at this event is powerful and will be very beneficial to any cop (leader or street cop) who attends, wanting to improve his or her understanding of strategy, tactics and the crucial ability to decide under pressure. I have attended the the symposium in 2012 and 2011 and it is quite frankly the best developmental training on the moral, mental and physical dimensions of conflict and competition, decision making and problem solving I have participated in. 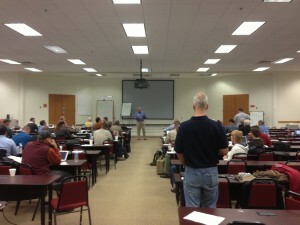 For the third consecutive year, Boyd and Beyond was held at Quantico, Virginia. This year we had a record turn-out, approaching 100 on Saturday. In fact, had we had 138 total RSVPs, and many had to cancel at the last minute. This year we were missing our traditional “law enforcement” contingent, but added speakers from areas not traditionally associated with Boydian thoughts and methods, most notably NGOs and humanitarian relief organizations and web design/marketing. Mary Ellen Boyd, one of John Boyd’s daughters, joined us for both days, and her active participation, for me, was a true highlight of the event. Chet Richards, author of Certain to Win, a close associate of Boyd and the only person authorized to give Boyd’s presentations, gave a one hour talk on Boyd’s Conceptual Spiral and The Meaning of Life. Chet was kind enough to include the paper he delivered on his website Fast Transients. The paper is a fascinating exposition into “how” Boyd’s ideas developed, and the circumstances surrounding the evolution of his presentations. Terry Barnhart, who has a new book out, Creating a Lean R&D System, walked the audience through the development of an A3, a tool used in Lean problem identification and solution, and sourced from John Shook’s Managing to Learn. Terry’s passion and depth of knowledge have been a benefit at each Boyd and Beyond event since 2010, and this year was no exception. How do you look at context? And categorize the (1) dividers—who are inherent in conflict and (2) the connectors, who provide cohesion in spite of that conflict, but are often invisible in the heat of battle. Marshall said the four most important components of NGO participation in conflict zones were: respect, accountability, fairness, and transparency. While a presentation from an NGO was unexpected to many who have attended these events, Marhall’s was one the best received and most discussed talks of the two days. Venkatesh Rao, author if TEMPO, and blogger at ribbonfarm, was the first speaker on Saturday. Venkat’s talk was titled “What Does “Inside the Tempo” Mean? and he went on to provide eleven examples, but started with the classic story of the hedgehog and the hare, which illustrates Venkat’s proposition that “mental models are an addiction.” This line of thought squares with Boyd’s admonition to regularly create and destroy mental models as the need arises. Gahlord Dewald spoke on what he called “dreadful efficiency” and spoke of the challenges presented to web designers and marketers in providing both content and advertising in media that range from a large PC screen to a mobile PDA device. While I had never considered the problem, it appears the “efficiencies” of a “super computer” in your pocket remains presents “dreadful” obstacles to our traditional methods of advertising and marketing. This is just a thumbnail review, so I’ll wrap it up by saying the same mental fatigue that has characterized these two days in October accompanied this event. We’ve tentative plans for a Spring 2013 event on the west coast, and based on response this past weekend, will probably happen. Will keep you posted.